UCLA has a comprehensive recycling and waste management program. The University has a program that recycles a wide variety of materials including food and beverage containers, plastics, paper, metals, green waste, food waste, construction waste, electronics, and more. The University has also pursued a number of waste reduction initiatives, from clothes donation to paperless initiatives. If you have questions about what goes in the bins, or how to recycle different materials, check out our Recycling FAQ. UCLA’s Zero Waste efforts were recently highlighted by the Mayor’s office in a special City of LA Zero Waste Progress Report. 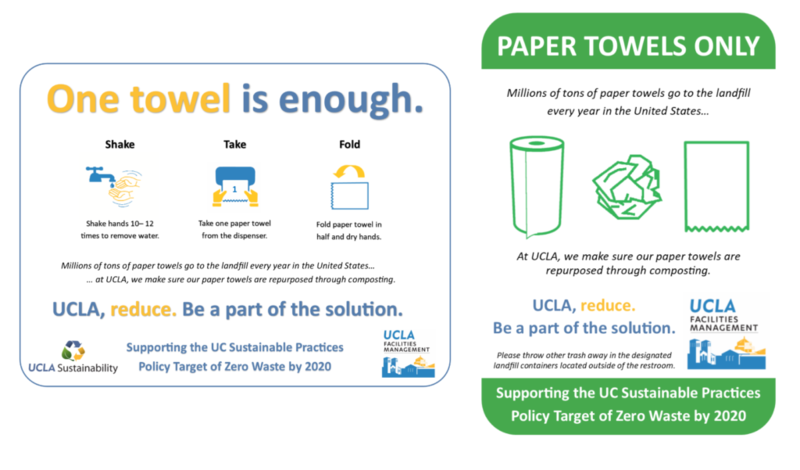 In an effort to reduce the consumption of paper towels, UCLA will be placing these labels to encourage users to reduce paper towel usage. Paper towel receptacles designated for composting will also be provided in the restrooms as well to reduce the university’s carbon footprint. Select buildings and departments on campus will be participating in a Zero Waste Pilot as we prepare for a university-wide transition. 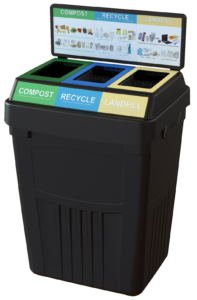 These pilot sites will receive new tri-stream containers, which will allow users to sort their waste into compost, recycling, and landfill streams. We are currently not accepting any more pilot sites, but if you are interested in getting a head start in transitioning your department or building, please contact Kikei Wong, Zero Waste Coordinator, at kwong@facnet.ucla.edu. You asked, we listened! We will installing more compost containers throughout campus and improving the signage on our current trash and recycling containers. Be on the lookout for the new containers! To achieve highest and best use of materials, UCLA has partnered with Human-I-T to refurbish electronic waste rather than sending the materials to recycling/demanufacturing. The refurbished products will be provided to low-income individuals, underserved communities, and nonprofits in need of technology, internet, and digital training. You can learn more about Human-I-T by clicking here.